Condo was everything that could be expected and more My wife sais she felt at home when we walked in the door. Everything you would need was there at your disposal. The bed was absoloutly wondweful as was everthing else. It made our trip something to remember. Again thank you for your help. Great condo in a great location! Great find! This clean and comfortable hotel-like unit was a great place for us to stay in as we explored Kauai. Located on the central east coast of the island, day trips in any direction were a manageable distance and you are able to explore all areas of the island without huge travel times. Located in a hotel complex, this unit gives you beach front resort style accommodation at a fraction of the price! Booking through the hotel proper would have been considerably more. This unit is well equipped with beach toys, lounge chairs, guide books and even a cookbook of tasty meals that can be made using rooms kitchenette. 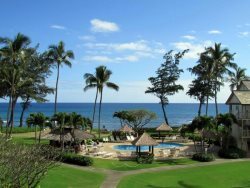 A great deal and a relaxing place to stay while on Kauai. Paradise! Loved the place. Everything you need for the beach. Chairs, games, mats for the beach even a umbrella. Centrally located. Close to restaurants, entertainment, shopping and beach. Definitely want to comeback. View view view This condo is lovely and nice decorated just like the pictures. Exceptional is the view from the terrace.The condo is near the beach and you wake up with the sound of the waves. The resort is very quiet and peaceful. The bed sleeps good, the towels are of a very good quality and everything is very clean. The owner answers prompt all your questions (check in procedures are very easy, it was the first time we stayed in a condo ) and gives a lot of information about restaurants, sightseeing and everything you can do in the neighbourhood ( walking distance ).There is a Lonely Planet in the condo.At arrival, we received a gift box with macademian nuts, parfum, free coffee,etc. Immediately, you feel at home. Thanks for the nice stay and we definitely come back !! This condo is perfect! Our recent stay was absolutely perfect. We were celebrating our 25th wedding anniversary and couldnt have found a better location on Kauai. The condo exceeded our expectations! The pictures dont do it justice. Its so close to the beach we were able to see whales from the balcony! We enjoyed the beautiful sunrise every morning as we ate our breakfast on the balcony. We slept to the sound of waves every night. The whole resort was beautiful and even though the parking lot was full every night the resort never felt crowded. There was never a crowd down at the beach. Its centrally located on the island so we never had far to go for our sight seeing trips. This is a great place to stay and I have already recommended it to several friends. Sensational Experience I stayed at the Islander on the Beach in Condo 250. The owner of the condo was very hospitable and the condo itself was kept in great shape. I enjoyed that the condo was equipped with beach towels, beach furniture and boogie boards. We had a gift bag with macadamia nuts and chocolate covered macadamias. There was a box of post cards so we could send them to family and friends. The greatest part of the room was the view and the sound of the water. Just sitting on the lanai was relaxing. We had all the drink cups and untinsils we needed and overall it was as the title describes... a sensational experience. I went on this vacation with two of my girlfriends and we all decided we will be brining our families to stay in one of Dawns condos in Kauai in the future. Great location and unit We had a wonderful time at the unit. Balcony looks out to the ocean. Unit was very clean and had coffee maker (w/ coffee), blender, all the kitchen utensils, large bathroom w/ plenty of soap and shampoo, boogie boards, binoculars, beach towels, A/C, etc. Property had a pool with a tiki bar along with a few nice gas grills. Parking included but fills up quickly at night. The ocean front has a nice beach but not the best place to swim due to the shallow water reef. These is bar next door (Trees Lounge) that has great music. Dawn was a pleasure to work with. Very responsive and accommodating to our request. We would definitely stay at the unit again and highly recommend it! Wow!!! I dont even know where to start on telling how great this room is. No words or pictures can do it justice because it is just that nice. There were so many nice touches throughout the room. Its like youre at a five star resort and theyve been "expecting you." The room was stocked so well with towels, TP, coffee, creamers, utensils, etc. that we didnt have to replenish any! And it was extremely clean!! The ground on which the room sits are incredibly manicured and maintenance is all kept up. Every morning they were cleaning the pool of sand and spraying down the whole area. So clean!! The bar at the pool is so convenient!! We would get our drinks and go sit on the beach (which is lined with beach chairs, no need to carry your own). Even though the beach isnt meant for swimming per say, you can still go out there. There are tons of little "coves". Funny story - the hubby and I were sitting on the beach chairs and there was this huge ball of something. It looked like a jelly fish (black top, stringy stuff sticking out of it), and having read that some kid just got $60,000 for whale vomit, I thought thats what it was! Especially since we had been seeing tons of whales every day, right from the Lanai! I made my husband go running out to the water to grab it, yelling "If you let that go and I read on the news that someone found whale vomit and got $60,000, I will kill you!!" Turns out after researching on the internet, it was a rotting pomella (grapefruit like thing). My husband will never let me live that down. The town of Kapaa is absolutely charming and a perfect location! So is all the shopping right next to the parking lot! I could go on an on. You really do feel like you are at a five star resort. Get this room! You will not be disappointed! Dawn, we cant thank you enough for all the hospitality. You were born to do this. This has been the best rental we have ever had!!! Thank you, thank you, thank you!!! Couldnt ask for anything more in paradise I have stayed at several condos at Islander on the Beach and they have all been wonderful, but condo 250 is by far the best! The view is priceless of course and everything was very cute Hawaiian themed. But its the little extra touches that made this condo stand out...coffee and creamer already there, a basket of postcards, Hawaiian music in the CD player so you can just walk in and hit play. It was a truly wonderful place to stay and I will be back! Thank you for a great vacation! Awesome...Great amenities with a nice Hawaiian flare Beautiful accommodations for the price point, and great ocean view and breeze. Will definitely stay here again. Also great Wifi connection. This condo is a great place to stay. I recently stayed in condo 250 and found the condo to be everything needed in a home away from home. Its location on the island is conveniently situated near shopping, entertainment, and restaurants. I especially enjoyed the nice view of the ocean from the lanai. I would definitely recommend. Loved this condo. This condo was so comfortable and well done. The view is fabulous, and we loved staying in Kapaa. Everything was perfect and just as described in previous reviews. Very clean and pleasant. This condo lived up to all my expectations!! The room has just about everything. We will staying again. Great place, great price, great welcome! Our stay here was great overall. Nice to be steps from the beach. We stayed 8 nights; if this is your first time like ours, we enjoyed being central on the island - able to travel to each part within 30 minutes. I would suggest getting a maid about midweek just to make it feel clean again. Very welcoming because the room has beach towels, mini-fridge, books to explore the island with...great place to stay! Good morning just wanted to let you know how much we enjoyed our stay here, the room was perfect, it was great having the wifi and the bed was very comfy! As well having all the beach equipment was awesome as well. Once again thank you for the use of your beautiful condo we hope to return again one day! Mahalo Wendy P.